It may be winter in Brighton and your heating may be turned up to MAX, but that’s no reason not to go down to the beach today. We have all been guilty of ignoring Brighton beach especially if we are local and especially when it’s winter. This weekend we had our two nieces (8 and 12) and nephew (5) to entertain, so we wrapped up warm and went in search of treasure. What we found was that walking along the beach is much more exciting and much hungrier work in winter. Under the arches just down from the kissing statue you will find the ideal place to end your wintery adventure – OhSo Social. In my head OhSo was somewhere to go for a drink, especially on a summer’s evening and I was a little surprised when Restaurants Brighton asked me if I wanted to take my nephew and nieces there. I am happy to report that by day OhSo welcomes families to its cafe-bar atmosphere. The first thing that fills you with joy is the amount of space that greets you, something which isn’t apparent from the outside and something which any family needs. If you’re the family that enters a restaurant with half the contents of their house, then don’t worry, there’ll be room for it. A traditional seaside menu in trendy surroundings, it’s time for that treasure. The joyful vision of steam as you break through the light and crispy batter. 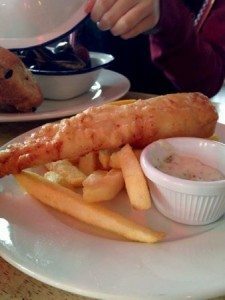 Served with tartar sauce and mushy peas (adult version) it is the ideal treat for young and old kids. 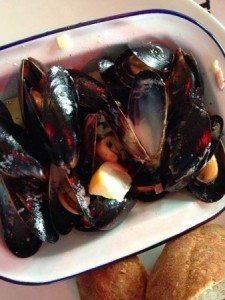 2 large dishes of hot and steamy mussels to warm you from the inside out; served with delicious rustic bread to enjoy mopping up the lovely cream sauce. Some foodies may disapprove of the small pieces of bacon it is served with but – it worked for me. The relaxed and modern atmosphere combined with the warm and friendly service where kids will find the bright and cool toilet décor a must see attraction is the ideal place to retreat for a while with all the family. There is always a bit of pressure on when on Aunty and Uncle duty. We need to entertain, spoil them a little, and send them home with some decent stories so we are allowed to take them out again. When asked if his food was nice and if he was enjoying himself, my nephew summed it all up with a loud “Yeah!”. Sometimes, a loud yeah says it all! February 14th – 22nd: Kids Eat Free! 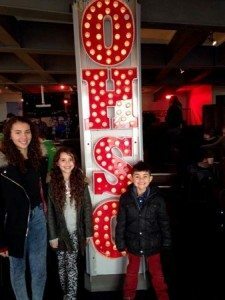 For every full-price adult meal, across the half term week, you get a kid’s meal absolutely free at OhSo Social.